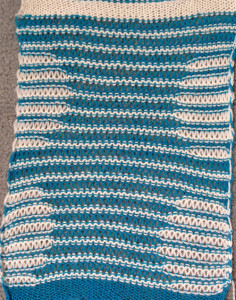 I began to think about color separations again, in reference to pile knitting, and returned to the chart used in the circular shape in the #1 blog post in this thread. 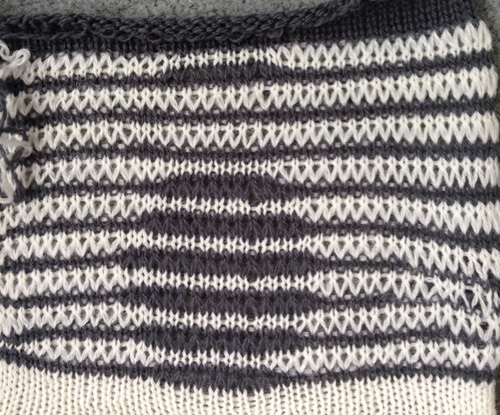 While studying it, it occurred to me that the fabric might be created by releasing the stitches at the end of the knitting. Brother punchcard books (now downloadable for free online), at the back usually had a page with “lace like patterns by KR” illustrating some of the possibilities in what I have been referring to as drop stitch lace. 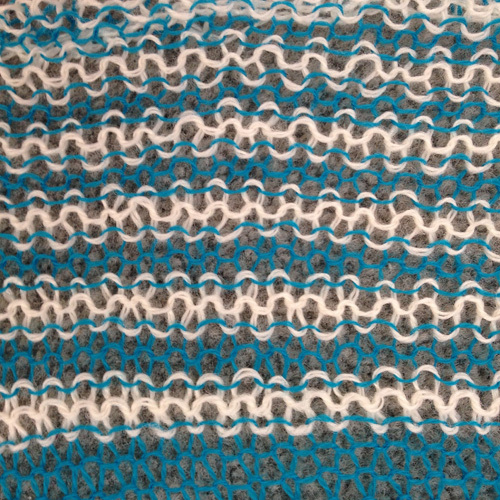 Once again, all stitches are transferred to the non patterning bed. Selected needles whether by hand or by the machine, are in this instance, not released until the very top of the piece is reached. In long pieces of this type of lace, I find dropping stitches at regular intervals rather then waiting until the end helps things run smoothly, and gives one the episodic opportunity to evaluate proper stitch formation, to move up weights, etc. 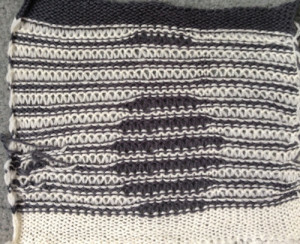 I found in my first swatch my inexpensive grey wool was really sticky and kept trying to knit with the white after the color was changed, explaining the mess on the left of the purl side image. Also, it pays to have some weight on, or at least to keep an eye on, the color changer side. 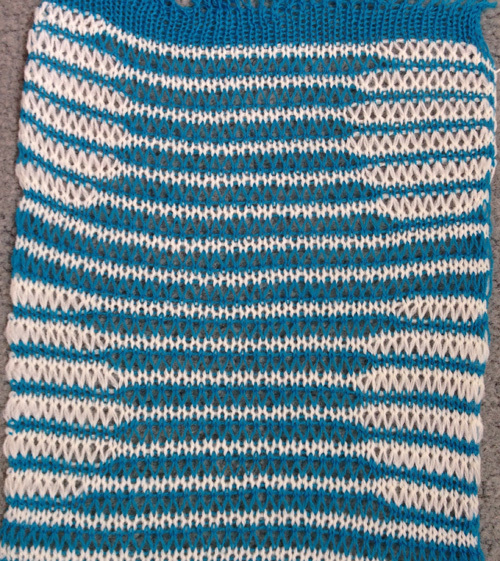 As yarn colors are carried up (every 2 rows) between color changes, if they are not long enough they will pull in the fabric on that side. If the end product is to be gathered at one end i.e. in a skirt, that could be an asset, but not so if the intent is to have it lie flat. 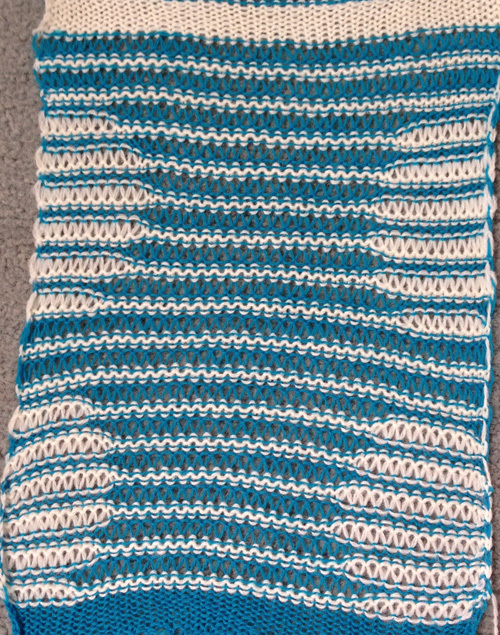 The pattern is programmed beginning on a row with black squares in it, ends on a blank row. Selection row in this instance is done from right to left (toward the color changer), the next color is picked up, and the process repeats every 2 rows. 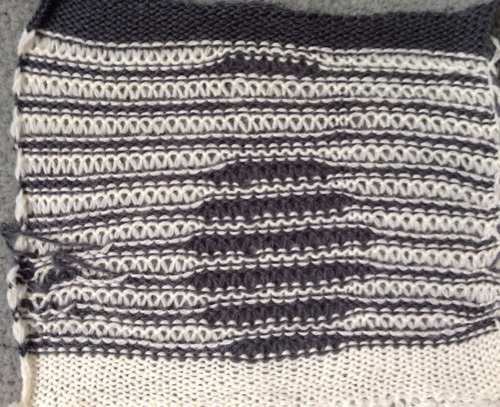 At the desired height I like to have the ribber knit the last row on only its needles, before the stitches on main bed are dropped across the width of the knit. Tugging on the comb and weights will speed things up. The fabric grows significantly in length, so watch where those weights are headed.